Lawrie Reilly (7 August 54) was a very good athlete indeed, as was his older brother Joe, who is not as well known in Scotland as others of his generation who accomplished less. Joe (8 July 1945) was ranked nationally on the track every year from 1964 to 1971, and ranked in One, Two, Three and Six Miles as well as in 1500m, 5000m, 10000m and 3000m steeplechase. Third in the SAAA Six Miles championship in 1965 with a time of 29:09.2 which placed fifth on the year’s statistical rankings, Joe was very unlucky not to gain international recognition. Lawrie is recalled by former team mates as slim, quiet and a bit reserved but very talented. His performances would have been good in any era. The family moved south to Liverpool in 1972 and both men ran for Liverpool Pembroke as well as retaining and using their Victoria Park membership. Lawrie wn no fewer than six internationl cross country vests for Scotland and still holds three junior club records for the Liverpool Pembroke Club – these are for the 3000m (8:10:57), the 5000m (14:10.2) and the 10000m (30:29.8). His range of talen was indeed wide – he is ranked at various times for 800m, 1500m, Mile, 3000m, 5000m and 10000m and well after his cross country international days were over, he ran 2:26:29 for the marathon in 1985. Lawrie first appeared on the scene in season 1968/69 as a Senior Boy. 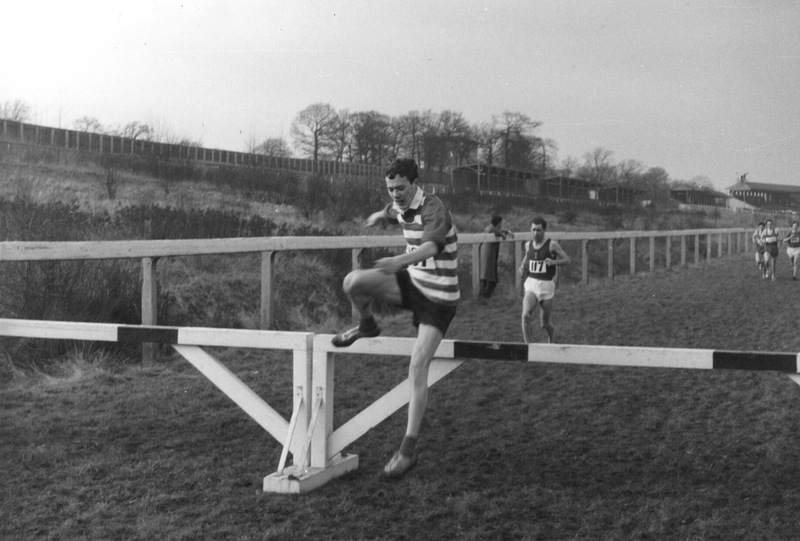 In the Midland District cross-country championships at Bellahouston in January 1969 he finished fifth individual in a team that finished fourth. Then in the National at Hamilton when he was tenth the team responded to the higher level of competition by finishing first. He showed even then what a good track runner he was when he topped the rankings for 800m (2:09.7 at Scotstoun on 12th June) and 1500m (4:20.5 at Scotstoun on 12th June). The 1500m time was when he won the Scottish School 1500m. Many young athletes are successful because they are physically very mature – look at the starting line of any U13 or U15 800m race – and they disappear when there are increased training demands as they progress through the age groups. Lawrie was not in the big, burly, physically strong category at any time. After a good summer, young Lawrie was still a Senior Boy and improved his Midland Championship run of the previous year when he finished second at Lenzie and led the team home to third place medals. The next championship was the big one and he was second in the national to Mulvey of Shettleston. That summer he again won the Scottish Schools 1500m title: on 20th June 1970 at Pitreavie, he was and exactly one week later in the first in the 15-17 age group in 4:05, and exactly one week later he took part in the first ever combined men’s and women’s Junior and Youth track championships at Grangemouth where he won the 1500 metres in a time of 3:58.9 which also won the Bank of Scotland Trophy for the best performance in his age group. He ended that summer with best times of 1500 in 3:57.6 which ranked him 26th in Scotland, 3000m in 8:36.2 (19th) and for 10000, a distance seldom run by Under 17’s, 31:19.8 (27th). The 1500m time was when he finished second in the AAA’s 1500 at Kirkby on 1st August. The 10000m time was run at Scotstoun on 31st July. The times were not just good, they were verging on the precocious. By winter 1970/71 he had stepped up to the Youths (U17) cross-country age group but it didn’t seem to slow his progress. If anything it accelerated the process. In the District Championships at Stirling he won the Youths race by 18 seconds from Gillespie of Springburn with Mulvey of Shetleston third. Victoria Park’s team of Reilly, Alexander (6th) and Inglis (7th) was also first. Not content with that, Lawrie also won the national in Bellahouston Pak from Rowan of Ayr Seaforth and Paul Bannon of Shettleston with Mulvey fourth. The team was also first with the other runners being Alexander 7th, Logue 12th, and Turner 22nd. The ‘Glasgow Herald’simply said “Laurie Reilly had a comfortable win the Youths 5000 metres.” And left it at that. Lawrie was listed in 1971 as St Thomas Aquinas HS and Victoria Park, while Joe was credited to Liverpool Pembroke and VPAAC in that order. His first race south of the Border was at the old track at Wavertree where the local runners knew nothing about him at the start of the race. He simply sat in for the duration of the race – then out kicked them all. They knew a bit more about the slightly built young Scot then. The good news is that Lawrie continued to run for the Scottish club; the sad news is that he missed the major championships that winter of ’71/’72. In the summer of ’72 he finished the season with best times of 3:58.0 for the 1500m which placed him 26th, 8:12.2 for the 3000m (5th), 14:35.8 for 5000m (21st), and 30:29.8 for 10000m (11th). 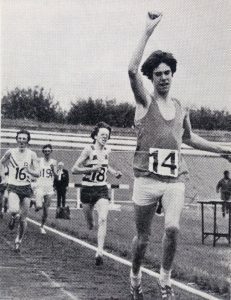 The last time, the 1000m, was run when winning for Liverpool Pembroke at at Kirkby on 11th June, 1972, which still stands as a club Junior record. 1st J Brown (Monkland), 2nd L Spence (Strathclyde), 3rd Lawrie Reilly, 4th R MacDonald (Monkland), 5th D McMeekin (Victoria Park). The club team was second. This run gained him selection for the Junior team to compete in the ICCU cross-country championships at Cambridge where he finished 20th. Brother Joe had run in these championships in 1964 and finished ninth. The following summer, living in Liverpool by now, he had best times of 3:52.6 for 1500m which placed him 11th on the domestic ranking lists, 8:10.6 for fifth place in the 3000m listings and he was ninth in the 5000m with a best time of 14:10.0. Running in the Pembroke colours, he ran the 3000m at Crystal Palace when finishing fifth in the AAA Under 20 championships on 14th July, 1973, and the 5000m at Derby on 4th September in the Northern Counties v Midland Counties v RAF fixture: both still stand as club Junior records in March 2017. In the cross-country season of 1973/74, Lawrie ran well and won his first world cross-country selection. In his second Edinburgh to Glasgow, Lawrtie again ran on the second leg where taking over in sixth place, he moved up to second collecting some good scalps on the way. Two seconds faster than Jim Brown on the same stage, he saw the club again finish fourth. Came the Junior National and this time Lawrie went two better than the previous year and won from Allister Hutton, Willie Sheridan and Lawrie Spence. The standard of running among this generation was very high indeed and Reilly was well up to it. The report in the ‘Glasgow Herald’ said only “Our junior winner, Laurie Reilly, has made the senior team, and it was little wonder after his clear cut victory over All-star Hutton (Edinburgh Southern). ” Yes, he did say ‘All-star’ Hutton – wasn’t my misprint. Selected for the Senior team for the international at Monza in Italy, Reilly finished 97th and was a counting runner for the Scottish team. The 3000m distance seemed to suit Lawrie’s talents better than any o the standard events with his rankings for it consistently in the top five or six. Strange then not to see him rated over the distance in summer 1974. That summer he was running for Sale, which was the only club for whom he was credited that year. Based in and running almost exclusively in England, he ran 3:56.9 for 1500m when finishing second at Oldham on 19th May, and 14:20.6 for 5000m at Crystal Palace on 21st September. 1st A Hutton, 2nd L Reilly, 3rd P Kenney, 4th J Graham, 5th J Burns, 6th W Sheridan, 7th J Thomson, 8th J McGarva, 9th P Forbes, 10th I Orton. He had gone into the race as favourite, but the report in the ‘Glasgow Haerald’ said, In the junior five miles, Alistair Hutton emphatically turned the tables on his conqueror of last year, Laurie Reilly. Hutton was always a threat to the favourite, but informed spectators must have been stunned to see a gap of 70 yards between them at the finish.” Yes, he did say Alistair Hutton – wasn’t my mis-spelling. The team selected for the international that year included Reilly among the seniors and he finished 43rd on the flat trail in Rabat. The 10000m time was recorded when he competed in the AAA’s championship at Crystal Palace on 1st August that year. The fact that he ran that time when finishing 13th indicates the gap in standards between Scottish and English distance track running at the time. Winter 1975/76 was his first as a Senior over the country and it was another good one. In the eight stage relay from Edinburgh to Glasgow, Lawrie ran on trhe sixth stage and gained one place when he went from sixth to fifth. He had fourth fastest time of the day behind Dave Logue, Doug Gunstone and Ronnie McDonald. The team finished sixth. At the start of 1976, Lawrie made a rare appearance in the District Championships at Coatbridge on 24th January and won from Frank Clement and Phil Dolan. Ron Marshall in the ‘Glasgow Herald’ commented at length on the race. “Scotland’s cross-country selectors have few opportunities to check on Anglos such as Lawrie Reilly. Normally they have to rely on newspaper results from south of the Border, but on Saturday Reilly came north to reinforce the printed word with a victory of impressive dimension. Slim, pale, scholarly looking, with a pair of unfashionable spectacles, Reilly gives the impression he would have a struggle lapping a kiddies playground, far less the four laps totalling six miles that an immense field of runners undertook at Drumpellier Park, Coatbridge, in a quest for the Western District senior championship. Appearances are deceptive. He is superbly fit. Winner last week of the East Lancashire cross-country title, Reilly counted among his victims Ron Hill and Mike Freary, two of the North of England’s best known faces. Last year on the track he dipped under 29 minutes for the 10,000 metres and his summer objective is to beat 28 min 30 sec. Two weeks, two wins. Reilly was clearly in great form. In the National on 14th February, racing at Coatbridge for the second time in less than a month, he finished fourth, six seconds behind Hutton, and was selected for the international at Chepstow on 29th February. The Scottish team finished a disappointing tenth in the race and Reilly was a counting runner when he finished in 81st place. Summer 1976 saw Lawrie Reilly ranked in five different distances. He ran the unfamiliar 800m distance in 1:54 to be fourtenth fastest Scot, his best 1500m was in 3:48.4 where he was eighth, in the Mile he turned in a 4:06.4 time to be seventh, his 3000m was in 8:02.4 and he was third best Scot over 5000m when he ran 13:54.6. Winter 1976/77 was one where we did not see too much of Lawrie in Scotland at all. He had a very good run in the Edinburgh – Glasgow. Back on the second stage, he pulled the club from sixth to fourth with the fourth quickest run of the day behind Jim Dingwall, Lawrie Spence and John Graham – it was a position that the club held to the finish and they had been fourth four times in five years. He had run in his last District race the previous year, and he was absent from theNtional championships in February 1977. He was nevertheless selected for the International in Dusseldorf where he finished 41st. By now Lawrie was appearing only as a Sale Harrier as far as the ranking lists were concerned and on 3rd May he turned in a 4:06.5 Mile to get his summer off to a good start. A month later on 14th June he recorded 8:02.8 for 3000m and on 7th August 5000m was run in 14:07.4. All three times were good enough to be in the top 10 Scots – 9th for the Mile and 5000m and 5th for the 3000m. Winter 1977/78 saw him firmly ensconced in England but still committed to Scotland. Nevertheless he missed the November relay as well as the District Championship but he was out in the National where he finished down in 23rd position. He was however selected – presumably on his form over the winter in the south – for the international to be held in Glasgow. On a very wet day with rain throughout the running of the race, he finished 97th. In the 1978 version of the Edinburgh to Glasgow, he was back on the sixth stage for the team that won second place medals. After Alistair Douglas won the first stage, Dave McMeeking was passed by Ian Elliott, Rod Stone and Jim Brown to hand over in fourth place. Albert Smith ran the fastest third stage of the day to move into second place and the club held that all the way to the finish with Lawrie holding it with Nat Muir, Doug Gunstone, Willie Day and several other top guns chasing him. In the National on 10th February, 1979, Lawrie in the blue and white hoops of Victoria Park finished sixth and was again selected for the international championship. Like many of the Scots senior team, Lawrie had a bad day at Limerick and finished 146th. The team was fourteenth – the worst ever finishing position. None of the big names in the team, and there were many very big names that year, performed to expectations. In summer ’79, Reilly’s times in 3000m and 5000m were good enough to be ranked but were slower than he had run for many years. His 3000m time was almost outside the top ten. They were: 3000 8:16.4 and ranked 10th, 5000 14:35.5 ranked 15th. By now he was not running in Scotland at all and in summer 1980 he appeared in the ranking lists for the last time with 1:53.2 for 800 placing him 18th, and 3:49.1 for 1500 9th. That is where the Lawrie Reilly trail in Scotland stops. Whether he was injured or stopped serious running for business and career reasons has not been noted anywhere. The SATS are assiduous enough to have noted any times coming out of England but there were none until 1987 when he ran a marathon in an excellent 2:26:29 – good enough to be ranked 24th. Such was the sandard of Scottish distance running at the time that Lawrie only gained one Scottish international vest. That was at Cwmbran in Wales on 9/8/75 against England, Wales and Northern Ireland where he was fifth in the 3000m in 8:01.8, the race being won by Jim Dingwall in 7:58. At British level, he was second in the Youths 1500m in 1970, and and second to Paul Bannon in the AAA Junior 3000m in 1973 and also placed eighth in the Euro Juniors in the 5000m in the same year. More information on the latter part of his career in athletics, or of his racing in England is really required to finish the profile but it is already evident that he was a very talented athlete and a loss to Scottish athletics when he stopped running seriously.